Print out these pretty Easter craft printables and then cut and fold them to make Easter baskets, egg holders, table decorations and more. We have them in colour or in black and white, for the children to colour in. All you need is some printer card, scissors, glue and nimble fingers! Kids can cut out this cute Easter chicken egg cup, assemble him with some simple cutting and sticking, and use him to decorate the Easter breakfast table! This fun printable chicken model comes complete with Easter eggs. 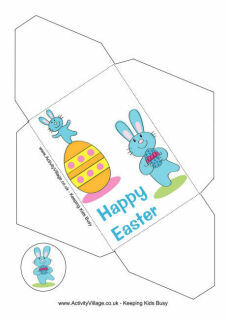 Cut, fold and stand up on display for the Easter table or classroom!